We may be at the Geological Society of America annual meeting today, but that doesn’t stop Fossil of the Week! 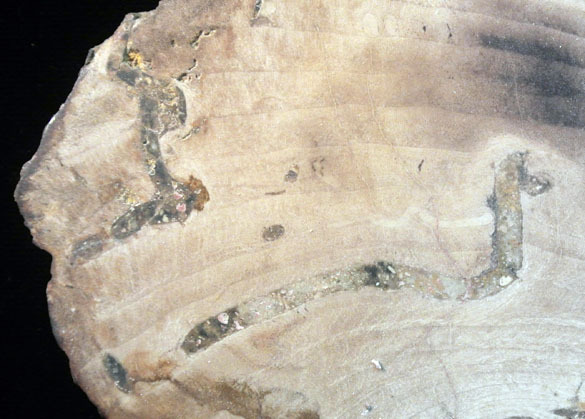 This week’s fossil is a beautifully-detailed piece of petrified birch wood (Betula) with tree rings and insect borings throughout. It was found in the Little Butte Formation (Oligocene) of Linn County, Oregon. This rock unit consists of thick tuffs and volcanic breccias representing volcanic mudflows and nuée ardente deposits that buried diverse hardwood forests. 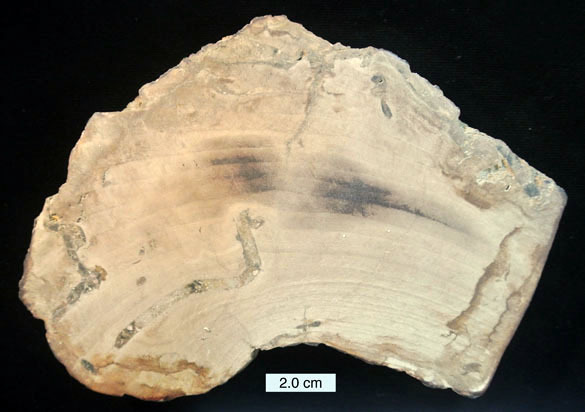 This formation is known for its spectacular silicified fossil wood. The beetle borings, shown in closer view above, are very similar to those bored in birch trees today. There is little work done on the ichnotaxonomy of these trace fossils, so I can’t yet give them a name, but at least we can see typical beetle activity in the twists and turns. The holes are apparently filled with a cemented mix of insect feces and wood fragments called frass, just like we find in modern birch wod today. Beaulieu, J.D., Hughes, P.W., and Mathiot, R.K. 1974. Environmental geology of western Linn County, Oregon. Oregon Department of Geology and Mineral Industries Bulletin, no. 84, 117 p.
Rozefelds, A.C. and De Baar, M. 1991. Silicified Kalotermitidae (Isoptera) frass in conifer wood from a mid-Tertiary rainforest in central Queensland, Australia. Lethaia 24: 439-442.